Charlie Verrill, owner of Will-N-Laineys, says that he flies the flag for relatives in Virginia, and that it has been good for business. 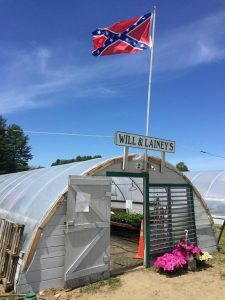 A Confederate flag flies over Will-N-Laineys farm stand in New Gloucester. Owner Charlie Verrill says the flag is an attraction to get business and that his family down South flies it. 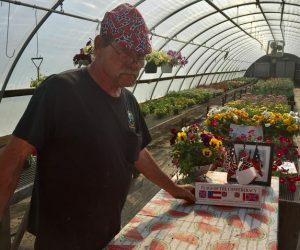 NEW GLOUCESTER — The owner of a New Gloucester farm stand who flies a Confederate flag in honor of relatives who live in the South says recent attention over it has been good for his bottom line. Charlie Verrill owns Will-N-Laineys – a farm stand and greenhouse business started by his parents on Lewiston Road. “I just put it there … it’s an attraction to try to get business,” he said, adding that he’s had people come to New Gloucester just to shake his hand after a recent story on the flag aired by WMTW-TV. “I think it’s helped business – free publicity,” he said. Verrill, who flies several versions of the Confederate flag on a rotating schedule, said he first began flying them about three years ago. “I have family down South – and they fly it,” he said, adding that he told his Southern relatives he’d fly it in Maine for them. He plans to get a new version of the flag with the words “heritage, not hate” printed on it. Verrill was “born and brought up right here” in New Gloucester, but he has relatives in Virginia and has also spent time in South Carolina, he said. Text resources used in Gray-New Gloucester’s 10th-grade U.S. history class include background about the Confederate flag and several different perspectives on its display. “Many people in the South see the Confederate battle flag as a symbol of Southern heritage and pride … as representative of the honor and integrity of the struggle for Southern independence,” says a background essay on the topic from publisher ABC-CLIO. “In stark contrast, many other people from the South (and other parts of the United States) understand the Confederate battle flag as a shameful reminder of slavery and the South’s military and political efforts to defend this institution,” the essay says. What’s known today as the Confederate flag is similar to the flag flown by Robert E. Lee’s Army of Northern Virginia, but never represented the Confederacy. Its design, the Southern cross, was incorporated in Southern flags late in the Civil War. Seeing the flag in public was uncommon until the 1950s and ’60s, when it saw a revival because of the Civil War centennial and opposition to the Civil Rights movement. The flag has become a highly divisive symbol often associated with segregationist and white supremacist groups. Many Americans see it as a reminder of treason, racism and slavery, leading to efforts to stop the flag from being flown at government buildings or incorporating it into state symbols. The movement to have the flag removed from public places accelerated after Dylann Roof shot and killed nine members of the Emanuel African Methodist Episcopal Church in 2015. Roof, a self-described white supremacist who told authorities that he targeted a historic black church in hopes of starting a race war, had posted pictures of himself posing with the flag to social media. The flag was removed from public buildings in South Carolina, retailers such as Wal-Mart stopped selling the flag and NASCAR disassociated itself from the symbol. Asked about a successful 2015 push to remove the Confederate flag from the South Carolina Statehouse grounds, Verrill didn’t mince words. “That’s a bunch of bull(expletive). … I’m hoping Trump will bring them back,” he said. Verrill said that the only time he agreed to take his flag down was to appease the Boy Scouts when a local troop wanted to have a Christmas tree sale at his business and the regional scouting organization had concerns about the flag being flown. “I brought the flag down … I’ll bow to them,” he said. “Like I said, I’m not prejudiced,” Verrill said. Libby emphasized that Will-N-Laineys is a private business and noted that the flag had been up for some time. “That’s his choice, and I support his right to free speech,” Libby said. While highlighting the importance of history and discussing his reasons for flying the flag, Verrill said he recently discovered his great-grandfather fought in the Civil War, though he’s not sure for which side. Even if it turns out his ancestor fought for the Union, Verrill says the Confederate flag isn’t going anywhere.